WASHINGTON — The Republican chairman is stepping aside from leading a congressional investigation of Russian interference in last year’s U.S. presidential election, citing ethics complaints that he mishandled classified information. The decision by Rep. Devin Nunes of California comes amid partisan turmoil on the House intelligence committee. Democrats have alleged that Nunes, who was on President Donald Trump’s transition team, is too close to the White House and cannot lead an impartial inquiry, and the House ethics committee is investigating whether he improperly disclosed classified information. Nunes’ move could be seen as a win for Democrats whose cries for an independent panel to investigate Russia’s possible ties with the Trump campaign have grown. They have pointed in particular to two Nunes trips to the White House — one announced, one not — as evidence that his loyalty to Trump outweighs his commitment to leading a bipartisan investigation. By all accounts, the intelligence committee’s growing partisanship has become a distraction from its underlying investigations. The top Democrat on the committee, Adam Schiff of California, said he appreciated Nunes’ decision to step aside from the Russia investigation. “We have a fresh opportunity to move forward in the unified and nonpartisan way that an investigation of this seriousness demands,” he said. As the majority party in the House, Republicans will keep the committee chairmanship. GOP Reps. Mike Conaway of Texas, with help from Rep. Trey Gowdy of South Carolina and Rep. Tom Rooney of Florida, will temporarily take charge of the investigation, said Speaker Paul Ryan. Two watchdog groups, Democracy 21 and Citizens for Responsibility and Ethics in Washington, or CREW, had asked the House ethics committee to investigate whether Nunes disclosed classified information he learned from intelligence reports. Nunes last month disclosed that Trump associates’ communication had been swept up by U.S. spy agencies and, he suggested, mishandled by Obama administration officials. The announcement was striking as it is unusual for a member of the committee to publicly discuss the existence of what would be classified intelligence reports. Nunes later acknowledged that the material had been shared by a secret source on the White House grounds, raising fresh questions about his coordination with the White House. Trump seized on information as evidence backing up his unfounded claim that President Barack Obama wiretapped the phones at his New York skyscraper. Schiff later saw the same material, but refused to publicly discuss what he learned. He said Thursday he understood the material was now to be shared with other intelligence committee members. Republican Speaker Ryan said he supported Nunes’ decision to step aside. “It is clear that this process would be a distraction for the House Intelligence Committee’s investigation into Russian interference in our election,” Ryan said. A Republican aide said Nunes and Ryan met Wednesday night to discuss stepping aside from the Russia probe. That’s when Ryan learned of the House ethics probe, according to the aide, who spoke on condition of anonymity to discuss about private conversations. 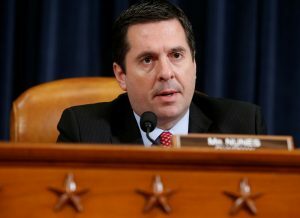 The ethics committee investigation of Nunes’ actions will be led by Republican Chairwoman Susan Brooks of Indiana and Democrat Ted Deutch of Florida. Conaway ascendance immediately drew attention to his statement earlier this year expressing skepticism about the subject of the investigation. In January, Conaway compared Russia’s interference in the 2016 election to the Democrats’ employing Mexican entertainers to help turn out the Latino vote. During the committee’s first hearing on the Russia probe last month, his questions were focused on how intelligence agencies prove who is behind a hack and what a foreign leader’s “intent” is. All 17 intelligence agencies have agreed that Russia was behind the hack of Democratic email systems and tried to influence the 2016 election to benefit Trump. Left: Chairman of the House Intelligence Committee Devin Nunes (R-Calif) questions FBI Director James Comey and National Security Agency Director Mike Rogers during a hearing into alleged Russian meddling in the 2016 U.S. election. Photo by REUTERS/Joshua Roberts.